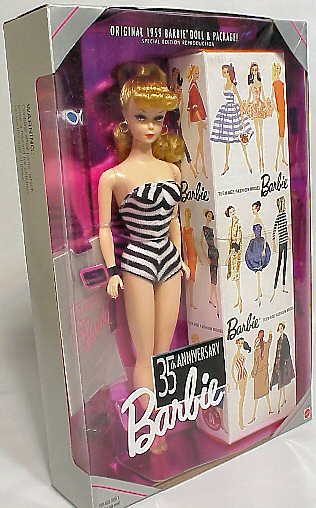 Mattel celebrated Barbie's 35th Birthday in 1994 with a reproduction of the #1 Ponytail Barbie, complete with white irises, gold hoop earrings and that famous Black and White Zebra swimsuit. The package even includes a reproduction wrist tag, box, sunglasses and black open toe shoes. It also has a clear stand. This is a very popular doll with collectors and many use this and the other vintage reproductions to display vintage fashions. There is also a 35th Anniversary Gift Set with the same doll and two vintage ensemble reproductions.